Beyond versatile! Use the 4 charts alone, connect vertically or horizontally with hook-and-loop fasteners to make a larger chart! 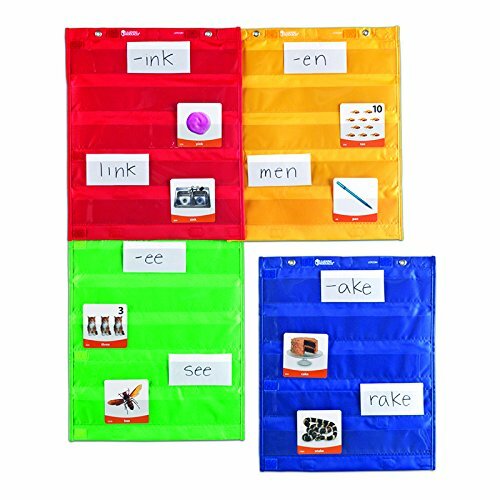 Great for small groups, centers, combined whole-group displays and more. Features 5 rows of clear pockets for your own cards, plus 2 large storage pockets on the reverse side. Four colors- red, yellow, blue, green. Hang with included magnets or grommets. Each chart measures 14"L x 17"H.
View More In Pocket Charts. If you have any questions about this product by Learning Resources, contact us by completing and submitting the form below. If you are looking for a specif part number, please include it with your message.